9 July 2013 I never shared the widespread ‘revolutionary’ enthusiasm. Nor did I believe that events in Egypt, any more than in Tunisia, were the result of a sudden historical upheaval. The peoples of these two countries suffered from dictatorship, from economic and social crisis; they rose up in the name of dignity, social justice and freedom. Their awakening, their ‘intellectual revolution,’ and their courage must be saluted. But to accept or justify a simple-minded, linear explanation of the political, geostrategic and economic issues would have been totally unconscionable. Nearly three years ago, in a book and then in a series of articles, I alerted my readers to a body of troubling evidences, and to the underlying geopolitical and economic considerations that were often missing from mainstream political and media analyses, and that insisted on submitting the euphoria that accompanied the ‘Arab spring’ to critical analysis. The Egyptian army has not returned to politics for the simple reason that it has never left. The fall of Hosni Mubarak was a military coup d’État that allowed a new generation of officers to enter the political scene in a new way, from behind the curtain of a civilian government. In an article published on June 29 2012 I noted an Army high command declaration that the presidential election was temporary, for a six-month to one-year period (its title made the premonition explicit: ‘An election for nothing?’). The American administration had monitored the entire process: its objective ally in Egypt over the past fifty years has been the army, not the Muslim Brotherhood (MB). The latest revelations (see the International Herald Tribune , July 5, and Le Monde, July 6) confirm what was already clear: the decision to overthrow President Mohamed Morsi had been made well before June 30. A conversation between President Morsi and General al-Sisi indicated that the head of the country’s military had planned the overthrow and imprisonment of the president weeks before the popular upheaval that would justify the military coup ‘in the name of the people’s will.’ A clever strategy! Orchestrate demonstrations involving millions of people in order to make believe that the army truly cares about the people! Coup d’État, second act. …..imposes its conditions on the United States as well as Europe. And all of this with the arrogance of an innate, absolute and sovereign right. 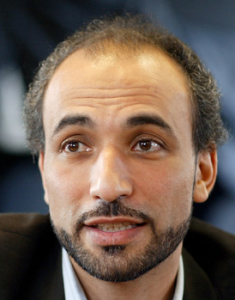 In the corridors of Washington or Brussels, everyone knows, everyone keeps silent..
Tariq Ramadan is best described as an independent power center within the Global Muslim Brotherhood who has sufficient stature as the son of Said Ramadan and the grandson of the founder of the Muslim Brotherhood to challenge positions taken by important Brotherhood leaders. His statements and writings have been extensively analyzed and he has been accused by critics of promoting anti-Semitism and fundamentalism, albeit by subtle means. On the other hand, his supporters promote him as as example of an Islamic reformer who is in the forefront of developing a “Euro Islam.” Ramadan is currently Professor of Contemporary Islamic Studies at the Oxford University (Oriental Institute, St Antony’s College) and also teaches at the Oxford Faculty of Theology. He is Visiting Professor at the Faculty of Islamic Studies, (Qatar) and the University of Malaysia Perlis; Senior Research Fellow at Doshisha University (Kyoto, Japan) and Director of the Research Centre of Islamic Legislation and Ethics (CILE) (Doha, Qatar). In 2009, Ramadan was dismissed from his positions as an adviser on integration for the city of Rotterdam and from a Dutch University over his role as a talk show host on Iranian TV. A ban on Ramadan traveling to the US was lifted in January 2010 and since then he has appeared a number of times in the US to speak at events organized by various US Muslim Brotherhood organizations. The Research Center for Islamic Legislation and Ethics (CLIE), headed by Ramadan, was launched in January 2012 and represented a significant coming together of Global Muslim Brotherhood leaders Tariq Ramadan and Youssef Qaradawi. In 2007, writer Paul Berman reviewed the controversies involving Ramadan and the Jewish community including his accusation that a group of Jewish intellectuals in France had had abandoned universal values in order to advance their community interests as Jews.